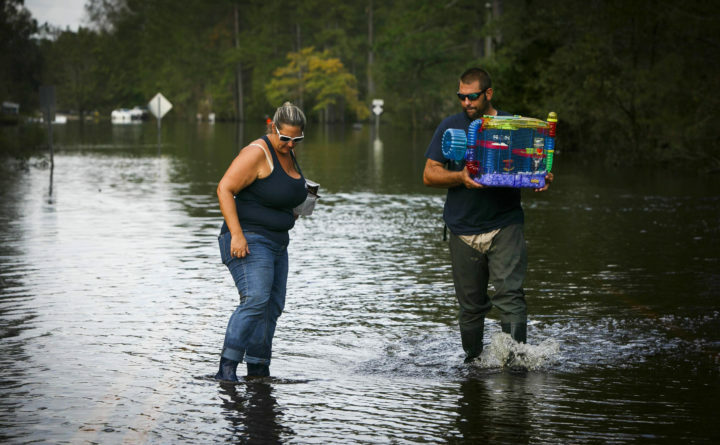 Kristen and Jason Atoigue walk through floodwaters after taking a boat to their house to retrieve their flood insurance papers and their son's hamster in Pender County, North Carolina, Sept. 21, 2018. The federal flood insurance program, which is critical to home sales, will continue to run during the government shutdown, according to the Maine Association of Realtors. The Federal Emergency Management Agency, which controls the National Flood Insurance Program, reversed course Friday night and said it would allow the program to operate despite the government shutdown. Instead, it will issue and renew flood insurance policies retroactive to Dec. 21 without interruption, according to Suzanne Guild, CEO of the Maine Realtors Association.